The term palate describes the roof of the mouth. Its anterior two-third is created by the palatine processes of the maxillae and posterior one-third by the horizontal plates of the palatine bones. It creates a division in between the nasal and oral cavities. The floor surface of the nasal cavity and the roof covering of the oral cavity are created by the superior and inferior sides of the hard palate, respectively. Anterolaterally, the hard palate ends up being constant with the alveolar arches and gums. The posterior margin of the hard palate gives connection to the soft palate and is free. 1. Incisive fossa, at the back of the incisor teeth is a small hole anteriorly in the midline, into which the incisive canals opens. Every incisive canal/foramen (right and left) rises into the matching nasal cavity and perforates the equivalent side. Terminal parts of the nasopalatine nerve and greater palatine vessels are transmitted by the incisive foramen. 2. The posterolateral corner of the hard palate medial to the last molar tooth has Greater palatine foramen, one on each side. It relays the greater palatine nerve and vessels. 3. Lesser palatine foramina are located just behind the greater palatine foramen and on every side remains in the pyramidal protrusion of palatine bone. They give progression to lesser palatine nerve and vessels. 4. Posterior nasal spine is a cone-shaped protuberance in the median position on the sharp, free posterior border of the hard palate. 5. Palatine crest is a rounded ridge near the posterior border of the hard palate. Transverse masticatory ridges on either side of midline. 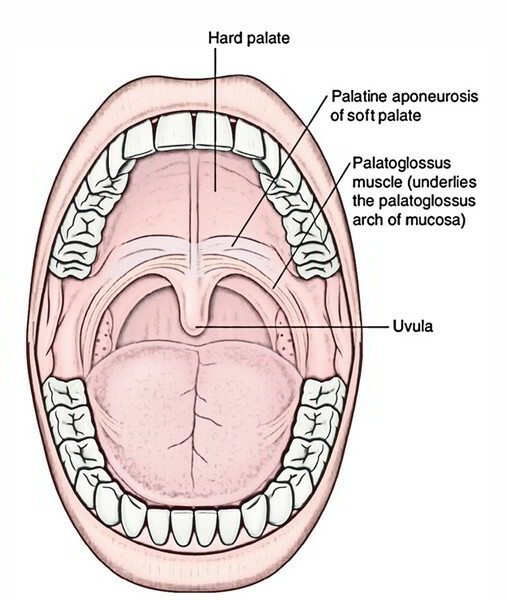 Palatine raphe is a narrow rim of mucous membrane expanding anteroposteriorly in the midline through a little papilla overlying the incisive fossa. The hard palate is edged by keratinized stratified squamous epithelium. Supply is carried out by greater palatine arteries via the third part of the maxillary artery. Every artery move forwards over the palate to go into the incisive canal and move into the nose and arises via greater palatine foramen. The veins of hard palate flow out into the pterygoid venous plexus (primarily) and pharyngeal venous plexus. The hard palate is innervated by greater palatine and nasopalatine nerves originated from pterygopalatine ganglion. The greater palatine nerve innervates whole of the palate other than anterior part of palate behind incisor teeth, which is innervated by nasopalatine nerves. The lymphatics via palate empty mainly into the upper deep cervical lymph nodes and couple of into retropharyngeal lymph nodes.